Hong Kong, 14, November, 2016 – Platysens today announced that it has been named a CES 2017 Innovation Awards Honoree for Marlin. Products entered in this prestigious program are judged by a preeminent panel of independent industrial designers, independent engineers and members of the trade media to honor outstanding design and engineering in cutting edge consumer electronics products across 28 product categories. 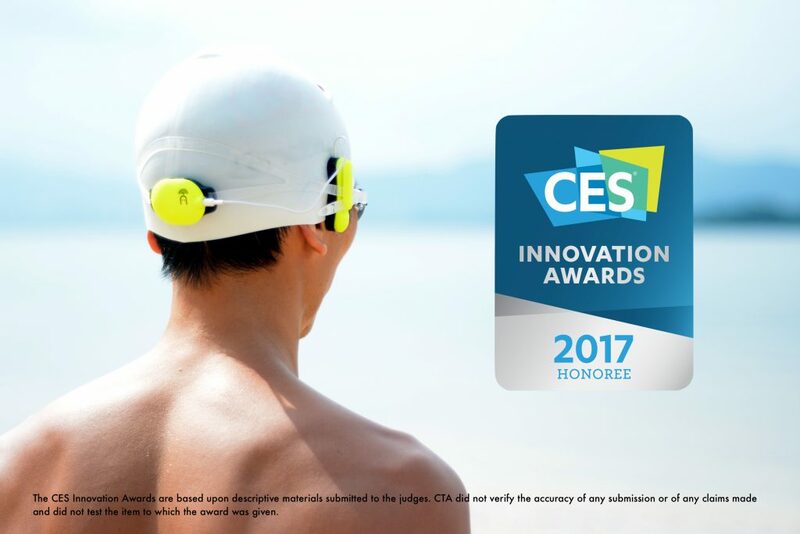 Platysens Marlin is a Swim Meter designed to tell you your swim performance through voice feedback using a bone conduction headset. Your pace is reported to you as you swim with no disruption to your swim stroke. When you swim, Marlin will provide navigation cues to guide you on your path. Key metrics such as lap time, lap count and stroke rate are reported in audio. For training, Marlin provides the Session Trainer, which allows for structured training programs to be stored in the device. After your swim, you can connect Marlin to your smartphone to upload your data. Configurations and settings can be controlled through the Marlin App, available on both Android and iOS. Platysens Marlin will be displayed at CES 2017, which runs January 5-8, 2017, in Las Vegas, Nevada. A selection of Honorees will also be displayed at CES Unveiled New York, which features dozens of exhibitors and networking opportunities and runs 3:00-7:30 PM November 10 at the Metropolitan Pavilion in New York. Entries are evaluated on their engineering, aesthetic and design qualities, intended use/function and user value, unique/novel features present and how the design and innovation of the product directly compares to other products in the marketplace. Products chosen as CES Innovation Honorees reflect innovative design and engineering in some of the most cutting edge tech products and services coming to market. CES 2017 Innovation Honoree products are featured on CES.tech/Innovation, which lists product categories, as well as each product name, manufacturer information, description, photo and URL. Platysens is a start-up company focused on sports sensors and analysis. Founded by sport enthusiasts, our sports sensors are designed to help athletes understand their performance. Platysens has been part of the in Incu-Tech Programme at the Hong Kong Science and Technology Park since 2014. Platysens has received funding from Hong Kong’s Innovation and Technology Fund (ITF) as part of its Small Entrepreneur Research Assistance Programme (SERAP).